Home/Guestbook/My recent PADI Open Water Diver course! I wanted to share my recent experience learning to dive with Down Below Dive Centre in Kota Kinabalu, Malaysia. I’m not usually a big contributor of reviews, but my experience with the Downbelow team was so good, I wanted to make sure they are recognised for the great work they are doing, so they can continue to provide great learning experiences for future divers. I completed my Open Water dive theory via the PADI elearning prior to my trip. As a non experienced diver some of these concepts were new to me, but the course was well structured and provided plenty of detail, so that after I completed the final assessment I felt well prepared. I though this was a great approach. Arriving at the dive centre with my girlfriend I was initially a little apprehensive knowing there would be lots of divers around, probably talking about diving stuff i would have no idea about. But after being promptly collected and transferred to the dive centre on Gaya Island, given a short briefing about safety on the island we were introduced to Richard who runs the centre. He was great at making us feel welcome and helped calm our nerves before assigning us to our dive instructor, a local guy who a found out later had only been learning English the last 12 months, which was hard to believe given his fluency. We were shown to the stores area and fully kitted out in 10 mins. It was very well organised and everyone was so friendly. My girlfriend’s mask did leak on the first dive so they immediately changed it for a much better one (at no extra cost). After 2 days of 1-2-1 training I had completed the course and felt as comfortable underwater as I do above. The instructor had a clear, calm and endearing quality both underwater and above, which made the whole experience very enjoyable. I can see why the DownBelow centre run so many IDC courses. After 3 days of diving we had to say goodbye and we were both genuinely sad to leave the team. 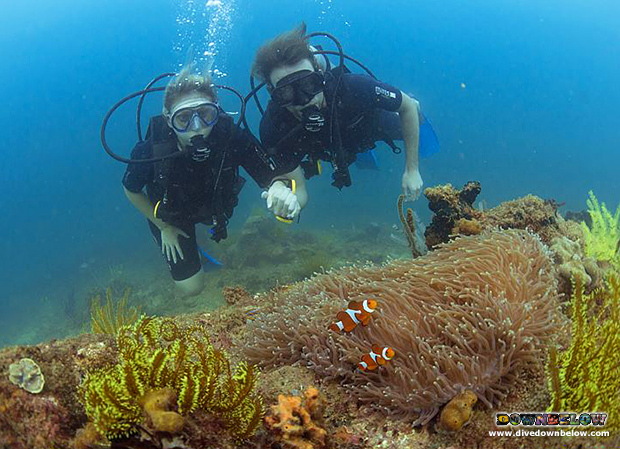 We’re already planning a repeat visit next year where I can do my advanced PADI, and see Richard and the team again. As a professional organisation responsible for a technical sport such as diving I can see why PADI needs to ensure their dive centres and associated organisations are maintained at a very high standard, and given my experience at DownBelow I can say that they are doing just that.